Our home has a spacious backyard that, until now, has been mostly used as a playpen for the dogs. We’d always wanted to use the space, but just hadn’t gotten around to it in all the time we’ve lived here. We did have a deck previously, but it was barely big enough for our family, let along guests. Finally, this past year, we made the decision to get a real deck that would allow us to entertain outdoors. Jeremy and the team planned and built us a low AZEK deck with a cedar pergola, and it honestly just looks great. We have a Japanese maple in the backyard and were prepared for it to be cut down to accommodate the deck we wanted, but Jeremy stopped us in our tracks and said he was going to instead incorporate it into the design of the deck. We agreed, and the results when it was all said and done are astounding. Cannot recommend this team enough, they did a great job from start to finish. We love our new deck! 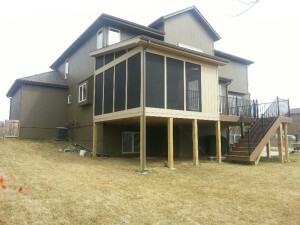 “Alexander homes did a fantastic job building my screened in porch. The craftsmanship is top notch. They have a tremendous amount of skill in their carpenter work. I had a unique design that needed to be created, in a sense that they needed to design a hip roof to incorporate into a gabled roof extending from my home to create the size that I was looking for. We worked together creating some drawings that created an end design that is awesome. Ours is built on a concrete pad, where they had to add new concrete and pin it to an existing pad that I had. They were able to measure all the angles of the existing pad and tie in the new concrete pad perfectly with the correct slope and angles. I think the most impressive thing about having a custom design is that the porch looks like it is a part of the house. So many of the other companies that I had bid simply had designs that look like something was just stuck on the end of the house. Ours looks like it belongs here! “Our experience with Alexander Homes was positive from start to finish. Dan Hall came over with a very polished presentation with pictures of finished projects and a thorough knowledge of products and possibilities. He presented his estimate in a timely manner and patiently worked with us to finalize our plan. Our project entailed the teardown of two existing decks and the rebuilding of one using the same footprint and reducing the other to a balcony. 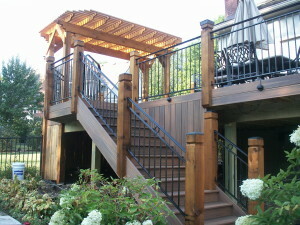 “Our decks are finished (except for one minor detail) and they look fantastic. We put in pavers and painted where needed, did a little landscaping update and the back of the house looks great. You should come see it and take some pictures for your book. Thanks for your polished sales pitch and prompt follow through getting us on board with Jeremy. "Our experience with Alexander Homes was positive from start to finish. "